The Crest Pro-Health collection of dental hygiene products is inspired by dentists, and formulated to give you a healthier, more beautiful smile for life. For optimal benefits, follow a Pro-Health regimen. 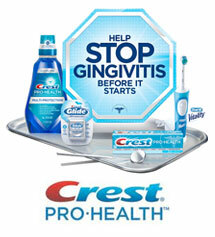 A toothbrush, toothpaste, floss and rinse collection to help stop gingivitis before it starts. The first ever complete collection of oral care products for kids 8 -12, with rinse, brush, floss and toothpaste made especially for them. A toothpaste and floss collection designed to help reverse gingivitis in as little as 2 weeks, while providing comprehensive oral health benefits. A toothbrush, toothpaste, floss and rinse collection to efffectively fight plaque and gingivitis while providing provide a clean, invigorating sensation. A toothbrush, toothpaste and floss collection designed to provide comprehensive oral health benefits to protect your sensitive teeth and care for your sensitive gums. Ask us which Pro-Health Regimen is right for you!